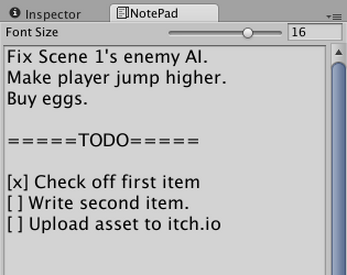 Just drag the asset into Unity and import it, then press Control+Shift+Alt+P (Command+Shift+Alt+P on Mac) to bring up the notepad window! You can then put it wherever you want and open it again with that shortcut. Includes a slider for font size, and that's about it! Just a simple tool for writing down notes for your project, in your project! If you have any ideas/suggestions, please let me know below! 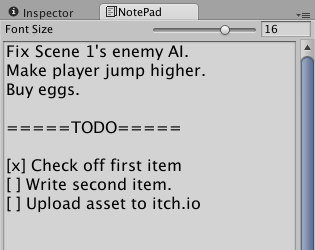 I edited your code a little so it the text won't be erased if the notepad window closed or if the unity editor itself closed. Sweet, added it! Seems to work fine.